The key to any good offense is balance, being able to run and throw the football so the defense cannot dictate the game based on your tendencies. 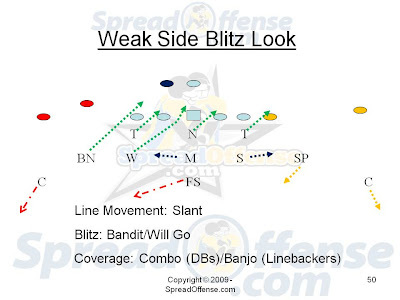 Most spread offenses run a zone blocking scheme with their offensive linemen, and 'combo' or 'slam' blocks are a key technique for the success of the run game. Notice the offensive line coach explaining the 'Lifter' (#76 in the video), usually the offensive lineman that has a defensive lineman directly over him (or being known as "covered") who is trying to get the top of his shoulder pad to the bottom of the defensive lineman's number (the number on the front of his jersey) and 'lift' him, prior to scrapping off to the linebacker. The other offensive lineman in the double team (or 'combo' block) is known as the 'Driver'. He (#53, the center) continues to drive the defensive lineman who was engaged in the double team.